Other photos: Profile, Profile, Cockpit Forward, Helm, Cockpit Aft, Cockpit Lighting, Cockpit Wetbar, Cockpit, Cockpit Aft, Cockpit, Cockpit Companion Seat, Cockpit Companion Seat, Helm Seating, Helm, Helm, Engine Hours, Cabin, Galley, Galley, Galley TV, Master Entrance, Master Stateroom, Master Stateroom, Master Stateroom, Master Stateroom TV, Master Head, VIP Stateroom, VIP Stateroom TV, Guest/Day Head, Guest/Day Head, Starboard Engine, Port Engine, Generator, Manufacturer Provided Image, Manufacturer Provided Image: Standard layout., Bow Pad. 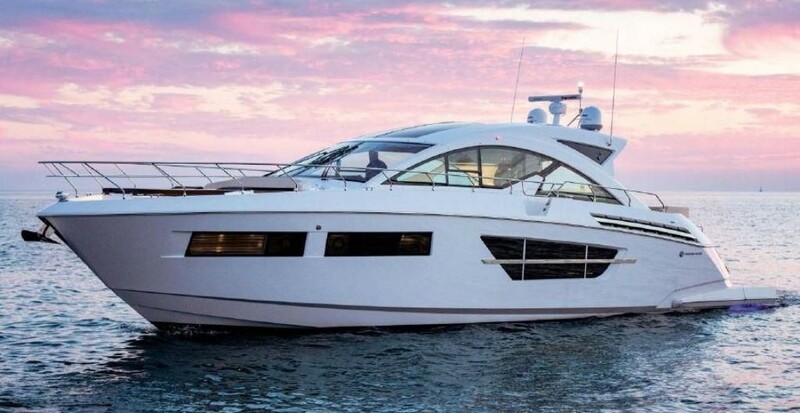 The Cruisers Yachts 520 Express is perhaps the perfect express cruiser! Designed shortly after the 560 Express, the 520 packs everything you could want into a smaller version. The cockpit can easily seat a dozen of your favorite friends, the cabin is large and roomy with a complete galley and both private staterooms have queen beds with the master being a full beam stateroom. Powered by twin Volvo Penta 715hp Diesel Inboards, performance will never be a concern. Owned and cared for by the most particular of owners, this fresh-water only Cruisers Yachts 520 Express is the cleanest you will find on the market. If you're in the market for a Cruisers Yachts 520, this one is for you. Call now to setup an appointment! SYS Yacht Sales is pleased to assist you in the purchase of this vessel. This boat is centrally listed by Bay Marine.